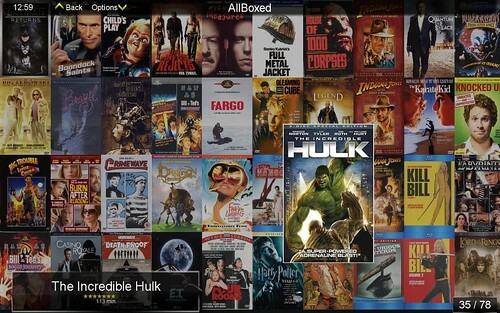 SageTV 7 has made some strides in many User Interface categories, but the die-hard movie fans still want more. If you’ve ever used Windows MediaCenter, you are likely familiar with MyMovies - a popular Movie metadata cataloging and management add-on for MediaCenter. Thanks to third-party developer, PluckyHD the developer of SageMovieWall SageTV now has an impressive Movie Collection Interface with built-in metadata capabilities all of which works on SageTV including extenders! MyMovies is a Movie Collection manager original designed for Windows Media Center. It has an extensive database of user contributed content encompassing metadata and fanart for movies. How this differs from IMDB.com and the like is that contribution to the database earns you points that can be used to unlock additional features and functionality in MyMovies. MyMovies also supports a Server/Client architecture. Your collection can reside on a headless server and be managed by any other machine on your network running the client software. For more information on MyMovies please check out their website. Some really nice work and something that will make SageTV even more attractive given most any video formats including Blu-ray, DVD, MKV etc all play in SageTV and their extenders without transcoding. I you have SageTV, this is a must-have plugin. 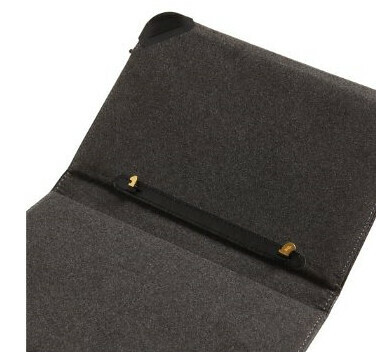 One of the interesting items hidden in the announcement about the new Wi-Fi Kindle e-Readers was the new Kindle cover with built-in LED light. I’m definitely drawn to this new cover (I’m often drawn to lights though) mostly because it looks like a good design for protecting the Kindle and it has a built-in LED light that tucks away and draws power from the Kindle itself instead of requiring its own battery. How much of a power draw on the Kindle this will be remains to be seen. You can pre-order the new LED Light Cover at Amazon now – should be available a few days or so after the Kindle is available. It appears those rumors about a new Amazon Kindle E-Reader weren’t just a bunch of hot air. After selling out of the 6” Kindle yesterday, Engadget & Wall Street Journal are reporting that Amazon has two new Kindle e-Readers coming our way! While this will really be the Kindle 3 or something like that, Amazon will be calling these two new e-Readers “The Kindle” and nothing more. Both are available for preorder Now and are expected to be available by August 27th. 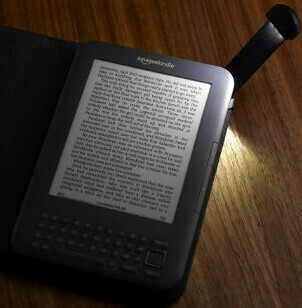 Smaller – 21% smaller than the last 6” Kindle – all size reduction happened on the frame around the screen as the screen size remains 6”. Thinner and now about 1/3 Inch thick. Faster e-Ink Refresh Rate – 20% Faster page refreshes! $139 (£109 UK) Wi-Fi Only. Great price point and one I can see dropping to $99 before too long. 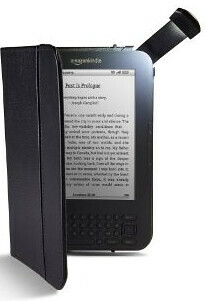 This one is the one that kills off much of the e-Reader competition in my opinion. $189 (£149 UK) 3G included free Plus Wi-Fi– this is the same Global (over 100 countries & territories) wireless in the current 6”. And now includes the Wi-Fi capability too for times when you aren’t in 3G range. Longer battery life – rated at a month with wireless turned off & 10 days with wireless switched on. Wow! Larger (double) Internal Storage – 4GB which is enough for about 3,500 books. Enough to last me oh… a lifetime. Webkit-based web browser included – experimental feature. Web Browser includes new "article mode" feature that simplifies web pages to just the main text- based content for easier reading. Web browsing with Kindle over 3G or Wi-Fi is free. Web Browser provides a New Voice Guide: With Text-to-Speech, Kindle can read out loud to you. New Text-to-Speech enabled menus allow customers to navigate Kindle without having to read menu options. In addition to listening to books aloud, users now have the option of listening to content listings on the home screen, item descriptions, and all menu options. What an awesome improvement for the vision impaired!!! Quieter Page turn buttons – The current version has a little “click” noise. I’m guessing they’ve eliminated this sound??? 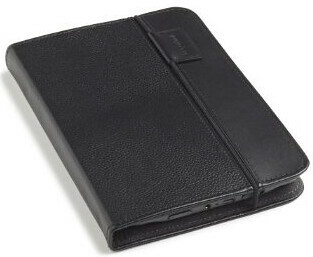 Optional (for additional Fee) New LED-Lighted Leather Cover features an integrated, retractable reading light that is powered by the Kindle itself – genius! The light is a permanent part of the cover that hides away into the cover when not in use. Details from this post were originally obtained from Engadget and Wall Street Journal. You’ll be able to preorder on these sites Thursday as well. I’m seriously considering getting one of the Wi-Fi versions as they have pretty much answered all of my wants for an e-Reader with the exception of the color e-Ink of which that technology just won’t be ready this year. Remember back when you began using an MP3 player instead of a Walkman? Okay, perhaps not all of you are as old as I am for that example but bare with me. Compare how listening to music changed when you upgraded to a good MP3 player versus that Walkman. That’s how much Sonos changed our home during the month I reviewed it. Now that you know how much I loved doing this review read on to see if I think it’s worth spending the $399 for the Sonos S5. Music has always been an important component of our home media and for many years I’ve used a Home Theater PC (HTPC) to serve music throughout my home with full control of my music collection – accessible from any TV set or computer in the house. 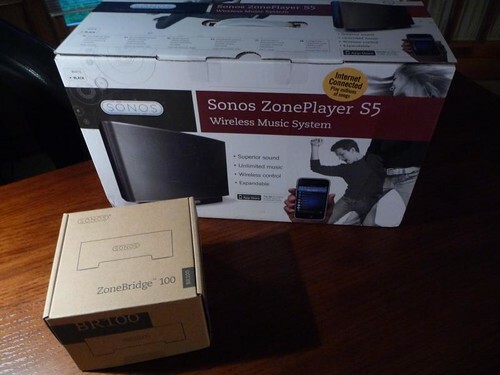 Before I began reviewing the Sonos system I was mostly satisfied with the music setup on my HTPC. A month of using Sonos has made me realize what I was missing. Sonos is a music “server” system that takes music and serves it from a PC, Networked Attached Storage, external hard drive or MP3 player and streams that music to one or more of your Sonos devices anywhere on your home network. Sonos also gives you access to a long list of online content including Pandora, Sirius and more. You have access to your playlists, genre &I artist info as well as cover art embedded in your music collection. Internet Radio – Use the Radio Guide to tune into over 100,000 radio stations that stream online. I found nearly all of the local radio stations as well as stations from all around the world. Why would you need a “music box” to play back your music when you already have a AV Receiver, HTPC, iPod etc? It’s about having instant access to your collection to playback anywhere in your home – including the deck or pool area. 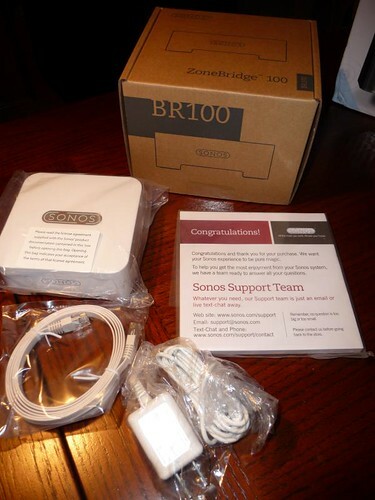 Sonos connects to your network with a wired, ethernet connection – you need at least one of your Sonos devices hard-wired by Ethernet or a $99 Zonebridge. From there you can have any of your Sonos devices around the home connect through your WiFi network. During the review period I had a single Sonos S5 mostly in the kitchen/living room area, but at different times would carry it up to the bedroom and even the outside deck. The only thing you have to connect is the AC plug to a wall outlet. I noticed the Amazon’s Kindle 6” is out of stock on Amazon.com with no date for when it should return. Put on your rosy-colored speculation glasses and you might expect to see a Kindle refresh with a version 3 in the coming day. Rumors of an August announcement have been swirling around the net for a while now including a slimmer version with improved contrast and the color screen for instance (Note: I don’t expect the color thing yet). Then again, it could simply be that they are selling Kindles faster than they can keep up with demand since they lowered the price to $189. The Kindle DX is still available too if you like that form factor. Stay tuned. 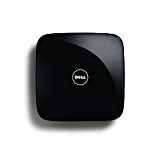 The Dell Zino HD is a beautiful mini-PC designed with HTPC in mind. Andy at MissingRemote has a very detailed review of this box that I recommend you check out. I actually have this very machine and should have my review out soon although it will take a little different angle so stay tuned. About a year ago I began exploring changes to the GeekTonic website logo. Since I’m no artist I was fortunate enough to get the help of Dan Sidler of DangerousPromotions.net who created the logo for GeekTonic and even made a few requested tweaks to it to fit my needs. Then sometime early 2010 I took the logo live without much fanfare. 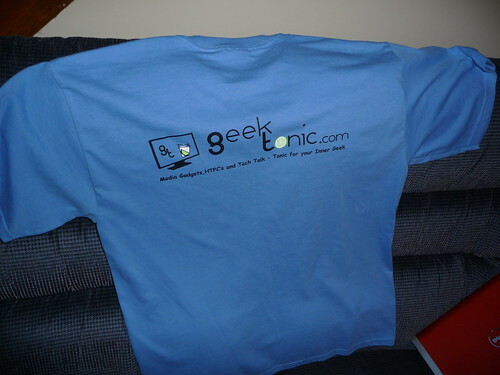 In the meantime, MrsGeekTonic went the extra mile and had a decent number of official GeekTonic T-Shirts – again with the help of Dan Sidler of DangerousPromotions.net. The T-shirts have been a hit around the family, but it’s time for a long overdue T-Shirt Giveaway! Now I know you are dying to get one of these awesome-looking T-Shirts so you can be in style as you visit Microcenter, Best Buy, the Apple Store, the Microsoft Store or wherever. I’ll have a couple of giveaways for these over the next few months but I’m doing them in small bunches so I don’t break the bank on shipping. Step 1. Take a photo of your Computer Monitor showing the GeekTonic Logo (from www.GeekTonic.com or for double votes a photo of a store computer showing the GeekTonic Logo. As an example, below is a photo I took of my iPad at an Apple Store. To get the extra “vote” though you’ll need to somehow show you are in a store (and not your house) in the photo. Step 2. Post a comment (use a valid e-mail so I can contact you when you win) to this post with a link to the photo. As long as you have a link to the photo location such as flickr, twitpic or wherever you put your online photos the comments system should show the photo once posted. I’ll announce 5 winners (chosen at random) of the first batch next week. I ship anywhere in the U.S. for free. Anything beyond that I might ask for help on the shipping depending on the cost. Family is not eligible to win this contest. If you are family & want a T-Shirt and don’t have one yet, please beg or bribe me. This logo was created by Dan Sidler of DangerousPromotions.net - much thanks to Dan for that by the way! Dan does great work so if you're interested in business cards, logos, flyers or other design, check out his site and send him a note. 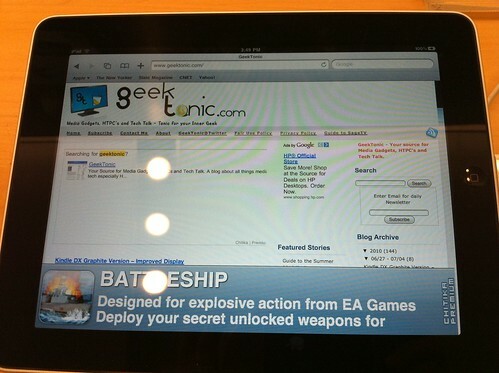 Dan is a GeekTonic reader and submitted this entry into the GeekTonic Media Gadget Showcase. 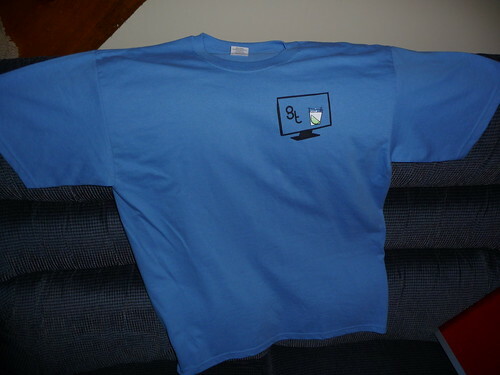 I have to give credit to MrsGeekTonic for the T-Shirt and the extra modifications required to make the Logo and design work on the T-Shirt. They really did turn out nice! I’ve spent a lot of time over the past several years showing off the home media setups of many GeekTonic readers through guest posts, but I’ve never taken the time to share what’s going on behind the scenes at the GeekTonic home. Starting today, I’ll begin showing off a little of what things look like at the GeekTonic home (good and bad) as well as some of the tech I use there. Hopefully this will interest some of you or at least satisfy your need to know where the GeekTonic writing and research is happening. First up is the office. You’ll notice that the desk is large and has two seating areas. This is for those times when MrsGeekTonic wishes to talk to me when I’m either spending too much time on the blog, on tech stuff or on day-job work stuff. 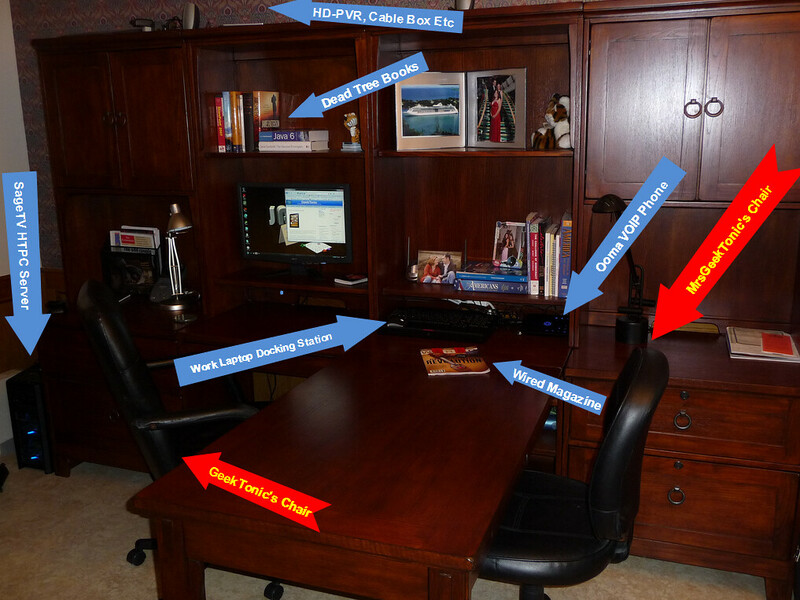 She does her share of teacher-tech work on the right hand side of the desk and you’ll often find her Dell laptop there as well. On the left side is where I spend much of my time. I’ll have my work laptop set up in the middle with a docking station and the monitor with keyboard for the HTPC. Lots of reading material (Note Wired Magazine – my favorite) is found around here and tons of “junk” hidden in the drawers and cabinet. The phone system runs from this room and PC as well. 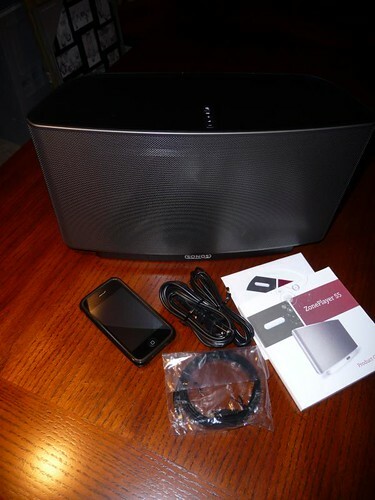 Note the Ooma Telo VOIP phone where we can retrieve our messages among other things. Ooma is a service we’ve been very happy with and once you pay for the hardware you can stick with the free (read: no monthly cost) service for basic phone. Way up on top of the desk you’ll find hidden a plethora of cords, a power strip, Cable Modem, Gigabit Router, Hauppauge 1212 HD-PVR Recorder, Time Warner Crappy Cable Box (serving the HD-PVR), Firewire to change the channels on that box and a few super secret pieces of hardware I’m reviewing. More on all of that later. I’ll get into the hardware lists along with a mini-review of most everything in the room in future articles as well as photos of the other rooms with tech. In the meantime let me know what questions you have if any. Each week GeekTonic covers the TV scene with a complete listing of premieres, finales and specials for the week. Mad Men & My Boys tonight and Rubicon next Sunday are the notables. Beyond those it’s a lot of “reality” and other weak summer fare.. Check out the complete list of new premieres and finales below. 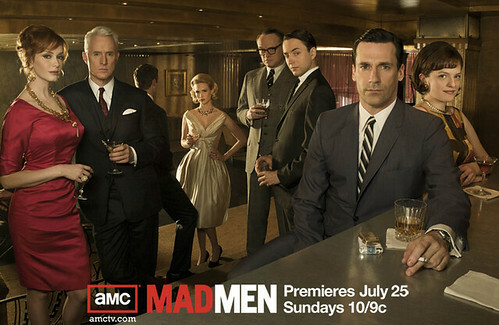 Mad Men (10pm on AMC – Available in HD) – Season 4 premiere of the Emmy-award-winning drama centered around a 1960’s era Manhattan advertising agency. This first episode titled “Public Relations” should be a little darker story with Don making a mistake that jeopardizes the new agency. Homeless: The Motel Kids of Orange County (9pm on HBO – Available in HD) – A documentary about the kids of the O.C.’s working poor. The other side of Orange County. Breakthrough With Tony Robbins (8pm on NBC) – Tony Robbins, the motivational/self-help speaker has a TV reality series to… get you off the couch. Plain Jane (9pm on CW) – A new fashion reality series with fashion expert, Louise Roe helping “plain Jane’s” prepare for their dates with a total makeover. The Colony (10:01pm on Discovery – Available in HD) – Season 2 premier of the reality series with seven strangers participating in an experiment to see if they can survive and rebuild after a simulated global viral outbreak wipes out most of humanity. X Games (11am & 5pm on ESPN) – The 16th edition of the extreme sports competition begins in downtown L.A. This New House (8pm on DIY) – New how-to series with Amy Matthews and Kevin O’Conner (from “This Old House”) touring homes across the U.S. showcasing innovative building materials, gadgets and techniques. Project Runway (9pm on Lifetime) – Tim Gunn and his fashion/reality series returns with season 8 of Project Runway. This premiere is a a special 90-minute premiere in a new time-slot. This season includes 17 contestants, the most in the show's history. Rubicon (8pm on AMC – Available in HD) – A new drama on AMC based in NYC revolving around a conspiracy at a government intelligence agency. Sons of Tucson (7pm on Fox – Available in HD) – The series finale of the sitcom known for its low ratings. These last few summer episodes are where they put the leftovers after it was taken off of the Spring schedule earlier this year. Money Hungry (9pm on VH1) – A new reality series with overweight people putting up their own money for a chance to win $100,000 for losing weight.